Give me doors! More doors! Mooore dooors! That sounds like something a mad doctor would scream out, tearing at his prematurely white hair and cackling, doesn't it? Perhaps this same mad doctor is who locked you up in the first place, leaving you to your own devices should you wish to escape. It's no use, though: figure your way through one door only to come to the next, and the next. 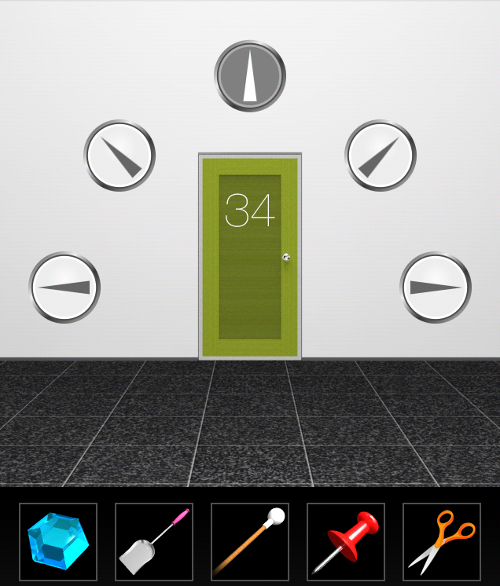 As a matter of fact, DOOORS 3 has forty doors to be exact, which brings boundless more escaping fun to your mobile device. Part of the original "clear-the-stage" escape game series from 58 Works, this episode is so far the best of the bunch. It combines logically-designed puzzles, interesting aesthetics and a smooth, intuitive interface, all exuding 58 Works' stellar quality. Aside from a few deviations, the difficulty ramp is a steady slope upwards, beginning with the easiest task—open a door, walk through it—and progressing toward more complicated mental tests. Stages sometime require point-and-click adventure-style feats of finding a useful item and using it properly, other times you'll need to decipher codes and work out puzzle solutions, and sometimes you'll need to shake, tilt or otherwise manipulate your mobile device to unlock the door in front of you. The combination of simplicity and cleverness makes DOOORS 3 both relaxing and maddening, and definitely worth having handy on your mobile device. For those moments, whenever they come up, that you need more door! 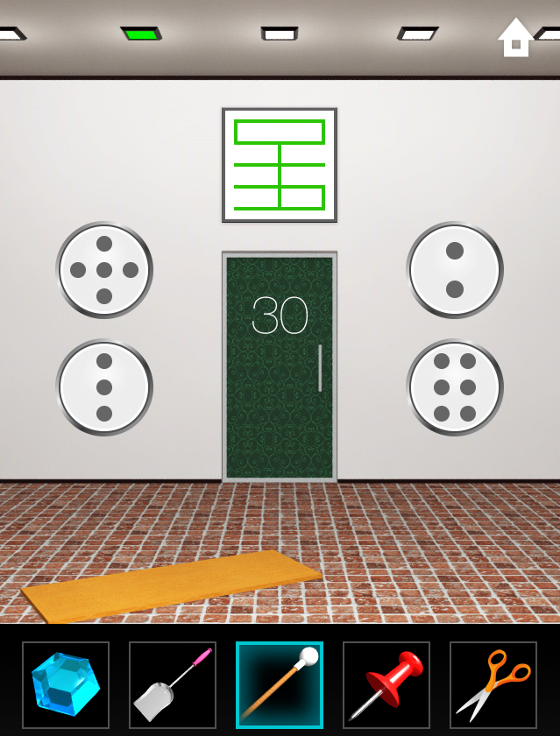 DOOORS 3 Walkthrough now available! In all scenarios, the following instructions tell you how to unlock the door. Unless otherwise noted, after you unlock it, you can tap on the door to open it then tap the opening to move on to the next stage. Press the down arrow until a KEY is lowered on a string. Take the KEY, use it to unlock the door. Tap the door 8 times until it breaks apart. Tap and drag the statue to the right. By tapping, turn each button until its line is matched up with the lines on the wall. Spin your device until it's upside down, causing the planks and ball to move out of the way of the door. Open the door and leave. Pick up the SHOVEL from the lower left corner of the room. Dig up some DIRT from the planter. Use the DIRT to put out the fire. Quickly tap all five of the green blobs to make them jump. Then--while all the blobs are still suspended in the air--tap the door to open it. Zoom in on the left wall and take the red TACK, causing the panel to fall away. Study the pattern that's revealed. Move the buttons on the left and right walls to match the pattern over the door (keep middle buttons toward the center, slide the top and bottom buttons toward the outer edges). Then, use the TACK to pop the bubble. By turning your device accordingly, move the red ball in the left window up, over the door, and into the red box in the right window. Move the blobs out of the way by tapping and sliding each blob up and off the screen. Tap either the left or right arrows in the correct sequence to blow out the fire. There's a bit of guesswork in this one because the arrows randomly alternate. Play with tapping them until you detect the pattern. When you are clicking the correct button, a light above the door will turn green. If you click a button at the wrong time in the sequence, one of the lights above the door will turn white again. When all seven lights are lit green, the door unlocks. A tile in the middle of the floor is missing a corner. Lift up that tile to see what's underneath: dirt. Use the SHOVEL to dig a hole in the dirt and find SCISSORS. Use the SCISSORS to cut the rope on the side of the room and a man will swing into view. Turn your device to the side, making the man swing all the way over until he kicks the light globe in the top right corner. Pull down the screen by tapping and dragging down the lever on the left. Study the clue that is revealed. 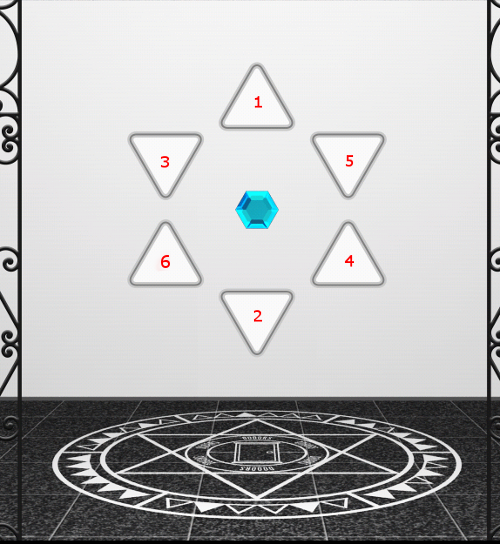 Then, tap on each of the four buttons, changing them to match the patterns in the clue. Then, pick up the steel POLE from the lower right corner of the screen. Use the POLE to block the guillotine. 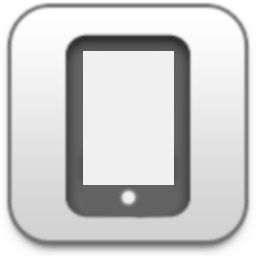 By tilting and shifting your device, slide the green buttons on the left and right sides of the door to the "up" position... The left button moves in a zig-zag pattern; the right button moves straight up. Tap and hold the wheel on the left and study the pattern of colors. Note how the pie slices of colors correspond to the circle fractions above the door. Tap the green ball repeatedly, keeping it in the air. Each time you toss it up without it touching the floor, a light will turn green. After tossing it 10 times successfully, all 10 lights will be lit green and the door unlocks. Look around the room to find six cards. For each card, note its suit and number.Using the cards as your clue, tap each of the buttons by the door in the correct sequence. There's one card on the white stool, three cards on the right table, one card on the floor behind the right table, and one card under the white stool. Tilting your device (using a flat surface as leverage), make the forward glass wall slide up while keeping opening in the background glass wall centered over the doorway. When no glass is in the way, you can tap the door to open it. Using a swiping motion, slide the wrought-iron gate upwards and out of the way. Then, quickly, open the box on the right and take out the PLUG. Use the PLUG in the hole over the door to stop the water. Four globes hang from the ceiling, representing various bodies of the galaxy. 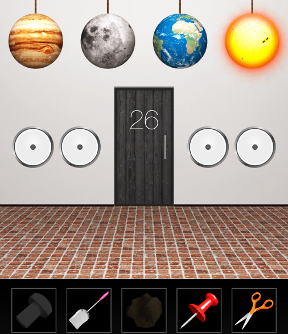 According to the globes' relative size, change the size of the dot on each button. After opening the door, tilt your device to roll Mercury out of the way. The design in front of you maps the route to the door. But, first, you must find the key. So, from the start, go up the left ladder twice until you reach the KEY. Using your SCISSORS, take the KEY. Climb back down twice to reach the starting screen. Then, go RIGHT, LEFT, RIGHT to reach the door. Use the KEY to unlock it. Press the square button in the lower right corner to turn off the lights. Study the patterns of green dots that are revealed. Then, turn the lights back on and watch the dial above the door, noting where it stops. 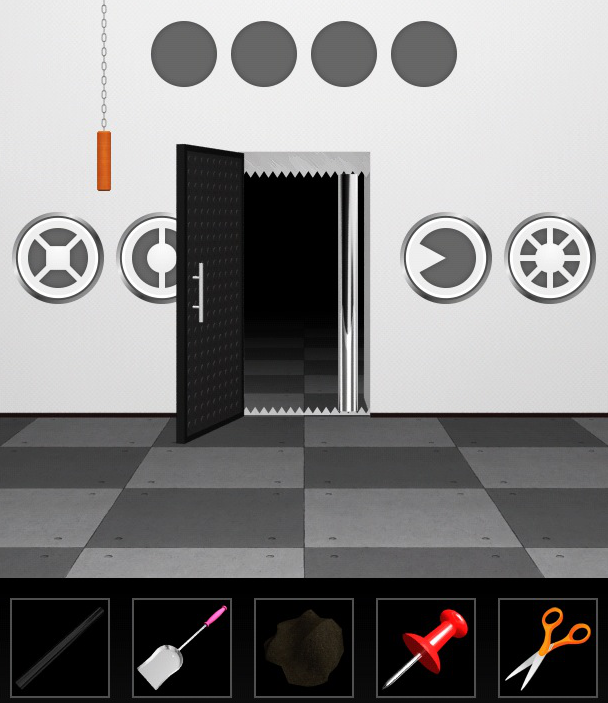 Tap the edge of the game window to see a clue written on the wall behind the tree on the right. Follow that clue to dig in the right spot (in front of the tree on the left) with your SHOVEL. From the hole, take out a KEY and a GEMSTONE. Use the KEY to unlock the door. Grab the STICK from the doorway, then exit. Use the STICK to press a button on the ceiling: the 2nd button from the left. 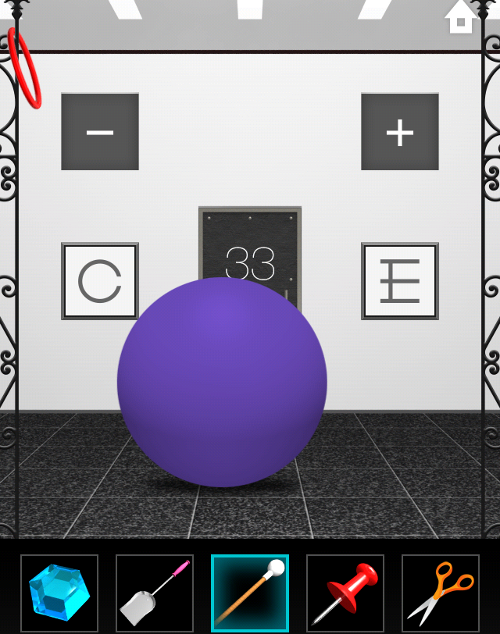 Change each button to have the number of dots as corresponds to the clue above. Positioning two fingers as shown, hold and spin the door 180 degrees. Use your STICK to remove the red band from the top of the gate. In a swiping motion, slide each side of the gate off the screen. Then look at the images in the white boxes on either side of the door; they need to be changed into new images. On the left: G minus a horizontal line equals C.
On the right: two horizontal lines plus three intersecting lines makes a variation on E.
Tap the blue blob in the center of the room and watch as its pieces fly off in various directions. Then, tap the buttons around the door under the arrows point in the same directions as the blue blob pieces. Using swiping motions, move the white panels off the stage. Zoom in to study the group of 9 dots on the left side of the door. Notice each has 1 or more segments. Enter 1 2 on the left buttons and 2 6 on the right buttons. Shake your device and watch as various shapes rain down. Count the number of each: squares, stars, circles and triangles (disregarding the different colors). Then, in the columns for each shape, tap to enter the corresponding number of segments. Tilt your device all the way to the left, then tilt it all the way to the right, then to the left...repeat this motion until the glass panel is no longer over the snowman. Give the snowman your SHOVEL for one arm, the STICK for another arm, and the red TACK for his missing button. When he has everything, he'll smile and move away from the door. Use your SCISSORS to remove the rope binding the gate in two places. Slide open both gate panels. Now, insert the blue GEMSTONE into the red star design on the center of the wall. The triangle buttons will turn white. NOTE: Puzzles can only be solved once you've closely viewed the clues. If you're having trouble making a correct answer work, click on all the available clues to be sure you've examined them all in detail. "pieces" on the nine circles and then press the green squares in the proper sequence. I had to check here because my solution matches the one here but the squares do not stay green. Even though you can see the number of pieces in each circle, you have to tap the circles area and it will zoom in and then the solution will work. Have you tried deleting then re-installing the game? Or checking on the app's download page for specifications? Please forgive me, as I've never written a game guide like this before, so I'm not sure if I'm being clear enough. I'm just excited that I actually solved all these last levels on my own and that they aren't on here, so I can actually contribute to something like this! Look at the shapes above the door. Tap the corresponding circles until, when you "add" them, the whole square will be grey. For example, the lower left is the "x" and the lower right is a "v."
Tap on the picture on the right to zoom in, then tap the picture. You'll see numbers that correspond to the corners of the picture.. Zoom in to the picture on the left and tap the corners in the order indicated by the numbers. The picture will fall down. Grab the tape. Tape down each of the tubes sticking up from the ground. Order does not matter. Tap the bars until the number of lit squares correspond to the number of lines in each image above the door. Tilt your device towards you until both circles fill with green. Tap the up arrow above the door. The circles correspond to the eyes of the robot. Tap the left robot's head, barely peeking out behind its right hand. Tap on the blub on the right side of the head to get the robot to "open" its eyes. Tap the first red carpet square in the second row. It will depress. Then tap the gold square next to it to reveal a putty knife. Grab the putty knife and use it on the "rough" part of the wall. Pull the chains in order to the number of "tips" of the flames. (or the number of "cut outs"
4 poles will rise up. Count the number of each shape. The line represents the poles themselves. Don't forget the circles on top. Then, select the correct number of squares for each shape. The poles will go down once you input an answer, but will rise again when you finish, so you can input the next number. Tap the red wheel in the bottom left corner. Swipe the left plant to the side to reveal a hole in the wall. Insert the wheel into the hole. Swipe the wheel in the correct direction until the white arrow lines up with the green arrow above the door. You can zoom out to check your progress, if you need to, and you can go backwards if you go too far. Tap the chair until it is under the chain of balls hanging from the ceiling. Tap the chain to pull it down, then tap the circles in order from top to bottom. Use 2 fingers to swipe to the right. Note the numbers made by the pink lines on the wall. Swipe back to the left twice and note the numbers made by the pink lines on the wall. Then select the correct number for each column, from left to right. Each triangle corresponds to part of the door. The upper left is the lower right of the door. Lower left is upper right portion of door. Upper left is the lower right portion of the door, and the lower right is the upper left of the door. 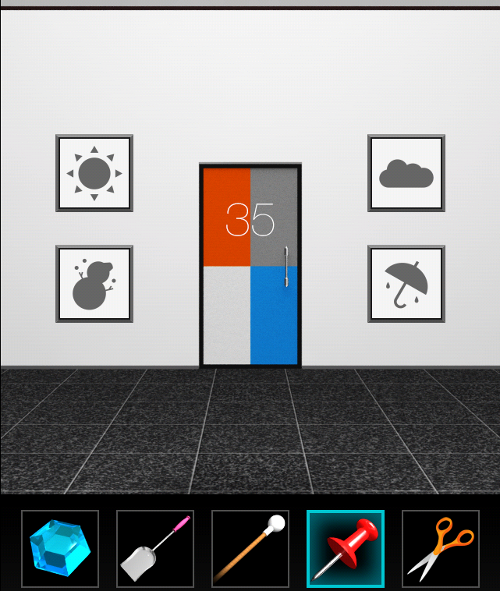 Tap each triangles until they match the colors of the door. Turn your device upside down to make the man disappear. Tap the table to the right to zoom in, then tap the orange paper. Tap the ruler. Tap the circles on the table to the left. Lay the ruler on the paper to measure the circles. Note the circumference of each. Multiply the two numbers and tap the squares on either side of the door until they match the answer. The smaller circle's circumference is 6, the larger is 14. 14*6=84. Use two fingers to pinch in to deflate the ball until it disappears.Then "spread" your two fingers to make the door bigger. Swipe from the left and right to "close" the doors and reveal the fabric/painting on each side. Note the squares that are different. Swipe to open the doors again. Tap to zoom in to the grid and tap the squares that were different. bottom square on the left, second from the top on the right. Tap the circular doors on the left to open them. The are both black. Tap each to close them. Tap each one to open them. The circles represent the colors of each half of the circles to the right. Continue in this manner, closing and opening the doors, until you have the colors for all the circles. From top to bottom: White and blue; yellow and red; red and green; blue and yellow. Tilt your device away from you so the poles raise. Spikes will come up. Tilt your device towards you until the spikes go down. Then, tilt your device to the left or right to move the ball out of the way. Tap the numbers to the right to zoom in, and note the direction each triangle is pointing. Tap the arrows on the left to zoom in and tap them in the correct order. Tap the red button. Tap the drain on the floor to zoom in. Tap the drain cover twice to reveal a key. Tap the key, and use the key on the door. 1 day = number of hours in one day. Number of hours in 1 year. The 12 represents 12 on a clock. Select the correct number for each square, for the number it would be on a clock. Tap on the circle to the left to zoom in, then tap again to open the door. Use the scissor to cut the wires the are connected. Use the tape twice to properly connect the correct wires. Look at the patter above, and try to get the sticks to match, so the two on the end are the only ones sticking up. I haven't exactly figured out how the sticks work, but the first time, whichever one you tap will affect only that peg. If you keep taping it, it will start to affect the pegs to the left and right. After lots of trail and error, I have come up with the following solution, though there may be a quicker/easier one. Use the tape on the "eye" on the floor and on each panel to deactivate the lasers. Tap to zoom in to the pillar on the left. Use the putty knife to pry the button up. Do the same for the pillar on the right. Look to the left, at the light near the top of the door. You should see something yellow/gold. It's a key. Tap to zoom in. Use the ruler to get the key. Use the key on the door. Another good one. Simple but it works. Pleasant.